Our mission is to serve the people, parks, and public space of the City of Richmond. Since 1990, we have enacted our mission by supporting The Department of Parks, Recreation, and Community Facilities through citizen involvement, education, and fundraising. The most prevailing of these services is acting as an umbrella non-profit organization for over one hundred volunteer groups and special initiatives, or ‘Friends of’ groups. Our partners include community and civic associations, outdoor enthusiasts, garden and history groups, and other citizen-based groups whose primary interest is to maintain, restore, preserve, or improve Richmond’s public recreational resources. By affiliating with the Foundation and becoming an official partner, these committed individuals may apply for grants and solicit tax-deductible contributions. In addition, they can lean on us for organizational leadership, resources and networking. The purpose is and has always been to provide a means for citizens to give back to their communities. Our phone number has changed in 2018! Please use the below number and extensions. Elizabeth Captain has a Bachelor of Science Degree in Accounting from the University of Phoenix. She has worked in public accounting for over 18 years. Beth received her Certified Public Accountant certification in 2015. Beth has worked at two non-profit organizations and finds the work to be very rewarding. Beth has a passion for accounting and for people. In her spare time, Beth enjoys exploring all parts of the country on her motorcycle. Alan is a Virginia native that has called Richmond home for the past 5 years. Alan received his undergraduate degree in Agriculture with a concentration Environmental Science from Virginia State University. Since graduating Alan has focused his work on community engagement. He has a passion for environmental stewardship and volunteer management. In his spare time, you will find him volunteering with Richmond city’s youth, running, or playing his bass guitar. A native of Richmond, Maurice is excited to join the Enrichmond Foundation as the Farmers Market Manager for the historic 17th Street Farmers Market. He brings years of experience in managing farmers markets and event planning, and a passion for making seasonal and locally-sourced food easily accessible to meet the diverse needs of communities. Maurice's other hats include performing as a co-founding member in local hip-hop band, The PhotoSynthesizers, organizing music and art showcases, and teaching conflict resolution to young people through his "Know Your HipHopStory" program. Jessica Maffey provides administrative assistance to the Enrichmond team as the Assistant Manager of Operations & TreeLab, grant and copywriter, and IT aide. Jessica has been living and working in Richmond for four years and developed a passion for nonprofit work through her visual arts background. She received a MA in Nonprofit Arts Management from George Mason University, with a focus on organizational accountability and grant writing. In her free time, Jessica enjoys doodling, petting dogs, looking at plants, and jogging Richmond's trails. Ted Maris-Wolf is an archaeologist, historian, and teacher whose work has centered on race, place, and the everyday experiences of African Americans in Virginia since the 18th century. As Caretaker of Evergreen Cemetery, Ted coordinates Enrichmond's research into and restoration of this national treasure. Ted received his Ph.D. in U.S. History and M.A. in Historical Archaeology from the College of William & Mary. Ted spends as much of his spare time as possible hiking, biking, and camping with his two sons and family. Allyson recently graduated from the College of William and Mary, where she studied Psychology and Sociology. Aside from her time spent in Williamsburg, she has lived in Richmond her entire life, and has a passion for the city's history, as well as its growth and development. She is excited to join the Enrichmond team to help contribute to all of the opportunities that Richmond has to offer! In her free time, Allyson enjoys spending time with close friends and family and exploring the city. Aaron McFarland was raised in rural south-eastern Pennsylvania where his parents operated a small wholesale nursery. Trees, plants, and nature were a big influence as he chose to continue his education, attending the Pennsylvania College of Technology in Williamsport, PA. After receiving two Associate degrees in Ornamental Horticulture, Retail Management, and Plant Production emphases, he began working in the Horticulture industry at a local PA garden center. He and his wife then moved to Vermont where he continued his career working at an organic vegetable farm and garden center. After spending four years in Vermont, Aaron and his wife then moved to Richmond to begin growing trees for Enrichmond’s TreeLab program. In his spare time, Aaron likes to listen to music and walk through the various parks in the city. He is also always looking for new opportunities to further his knowledge in Horticulture and discover new plants. Liza is a recent Richmond transplant who grew up in the Shenandoah Valley. She is thrilled to be working as Event Manager for Enrichmond! Liza graduated from Rhodes College where she studied Anthropology and Sociology. In pursuit of her degree, she developed an interest in the way communities shape their environments and environments shape their communities. She is driven by curiosity, creativity, and a desire to connect to the city of Richmond. She enjoys spending time outside, Richmond’s street art, and beekeeping. John was born and raised in Virginia and has called Richmond home for over 35 years. John received his Masters in Urban and Regional Planning from Virginia Commonwealth University and has been in the nonprofit field for over 20 years. John has been the Executive Director of the Enrichmond Foundation since 2011 and has grown the foundation from a one-person operation to the vibrant, multi-departmental team that it is today. In his free time, John enjoys camping the AT, building Lego creations with his son, and traveling with his family. 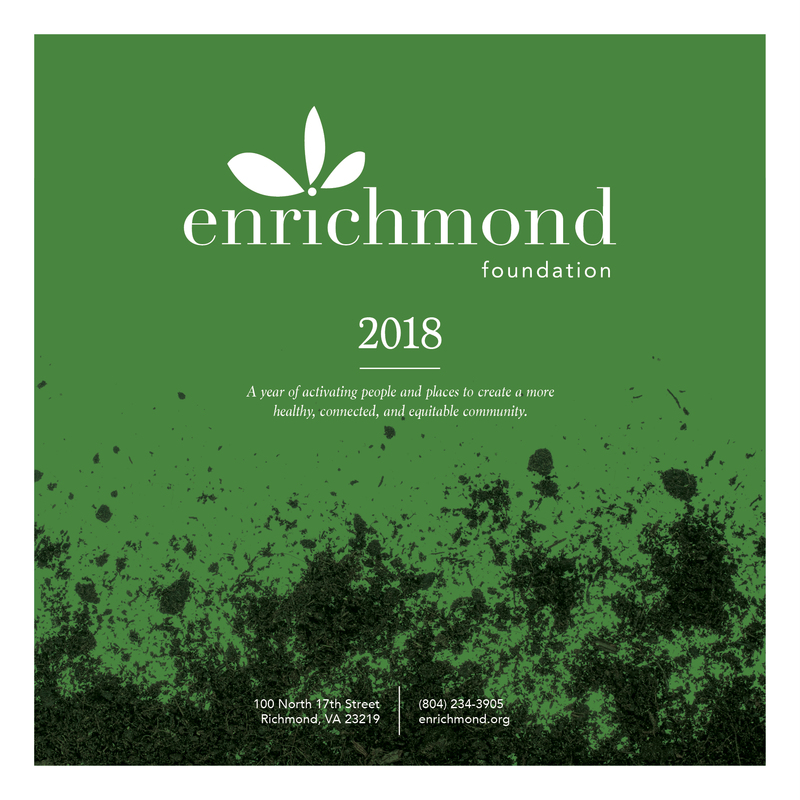 The Enrichmond Foundation is governed by a board of directors and works closely with The Department of Parks, Recreation, and Community Facilities. This relationship began when the Foundation was first established in 1990 with the assistance of the Citizen’s Advisory Board and The Department of Parks, Recreation, and Community Facilities. As part of our bylaws, initiatives supported by our Foundation must align with the City of Richmond Department of Parks, Recreation, and Community Facilities. The Enrichmond Foundation is a 501(c)(3) organization.